Len Dawson is a well-respected Hall of Fame player. As one of the game's star players at the time of the AFL-NFL merger, Len Dawson cards and autographed memorabilia are very collectible. 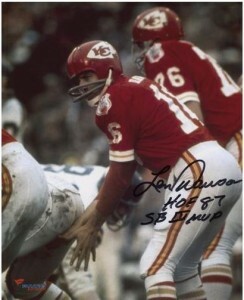 Dawson led the Kansas City Chiefs to three AFC Championships and would emerge victorious in Super Bowl IV as the game's MVP. 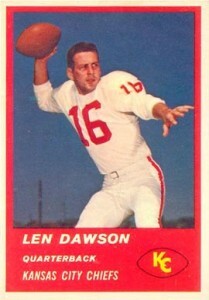 Len Dawson's rookie card is part of the 1963 Fleer Football set. It would be Fleer's last football card set for 13 years. Dawson also has three pre-rookie cards. Two are team issues from the Chiefs and the other is a regional promotion card from National City Bank. His first certified autograph card is from the 1989 Goal Line Art issue. The card is serial numbered to 100 copies. One of his most popular autograph cards comes from the collector favorite, 1997 Upper Deck Legends. Dawson's first memorabilia card can be found in 2001 Topps Archives. The card contains a piece of stadium seat from the old Arrowhead Stadium. His first game-used memorabilia card would come a couple of years later. 2002 Donruss Classics has a piece of one of Dawson's helmets embedded into 100 serial numbered cards. Dawson has always been a willing in-person signer. He also participates in some of the larger autograph signings throughout the year. The card's thin white borders make them prone to centering issues. Cards submitted for professional grading can sell for a substantial premium when returned in high grade. 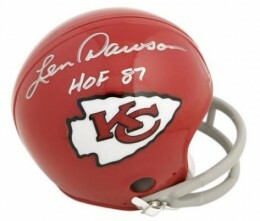 Below you will find an example of what Len Dawson's authentic signature looks like. This can be used as a first point of reference for determining the legitimacy of autograph memorabilia, but is not a substitute for having your items authenticated by a well-respected professional autograph authentication company. Some of the trusted sources within the sports memorabilia market include the following companies: PSA, JSA, Tristar, and Mounted Memories. Click on any of the images below to view full size photos. The "L" and "D" are larger than the other letters. All of the vowel letters display an open loop. The "D" is unique in that it resembles a lower case "n" that then includes a large loop that swoops over the top and back to the left. The "n" at the end of his name is almost always present. However, as he has gotten older, he sometimes forgets to write it. 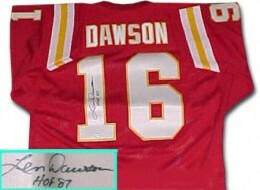 Len Dawson SIGNED Kansas City Chiefs JERSEY JSA WP. Chiefs Hall of Famer LEN DAWSON Signed Mini Helmet AUTO w HOF '87 JSA!! 1963 Fleer Len Dawson PSA 9 "None Higher"